Or commonly known as "Related Post". I was hoping to have an automated mechanism on it. In addition, recommendation of other posts could be a way to attract and retain readers to read other posts they might like, hence boast the hits. The red boxes should have something shown and I had few technical questions needed assistance. Unfortunately, I got no response after sending few emails to the support mailbox. Damn lousy support! Although it's free service, but the company must know that it's 2 ways win-win situation, that I use the widget and the company get free advertisement! Then I posted the technical question onto Outbrain.com as it was a little relevant to the Outbrain's star rating widget I use since I started Jacko.MY. On the same day, I received a response and following that I got a dedicated expert from Outbrain to assist me!! The best part, I was informed that Outbrain is in beta stage of testing their widget with pictorial post recommendation! Immediately I dropped LinkWithin and the outcome of the story is what you see in Jacko.MY now, the Outbrain's star rating widget with pictorial post recommendation, or Outbrain called it thumbnail recommendation! Sometimes the widget is not able to display the image from the post. Just like the first recommendation above, it only shows some text content. Well, I believe Jackie will help me on the issue. My thanks and appreciation to him or her for the good support from Outbrain. I am not sure if this enhanced widget has been officially published in Outbrain but if you want to have the same widget, you may send your request to support [at] outbrain [dot] com. You should get response fairly quick. Let's see what I can improve further. Comments welcome. 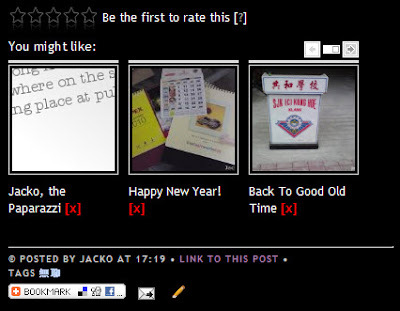 Thanks for the great post, and for giving us a shot, Jacko! I'm the founder of Outbrain. You're in very good hands with Jackie, but if there's anything I can also help with, please drop me a note to galai[at]outbrain[dot]com. One note about the food post being recommended in a gadget post - While our core algorithm is semantic, it does over time optimize to show the links that your readers found to be most interesting. Our slogan for this sums it all: "Readers of content don't want related. They want interesting, which is often unrelated." You can rest assured that if a link showed up via Outbrain, it is because our algorithm figured that your blog readers are more likely to be interested and click on that. We love supporting our bloggers, and love it even more when it's noticed and noted. So your blog post is highly appreciated! Thanks Galai for dropping by! And many thanks for the explanation, that sounds logic to attract readers by interesting posts not related posts.